Welcome, Trojan Family, to the beginning of another excellent year here at Hialeah-Miami Lakes Senior High School. In this new academic year, our vision of ensuring our students the best education possible continues. We remain steadfast in our quest to move students towards being proactive and self-directed lifelong learners. The HML family has worked hard to attain a new goal; HML is a ‘B’ school. Congratulations to all stakeholders for this outstanding accomplishment. 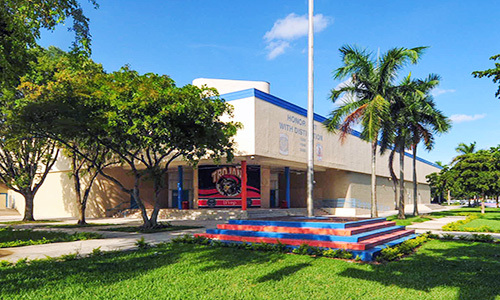 Hialeah-Miami Lakes Senior High has a tradition of excellence. Our IPREP program is flourishing, and we proudly welcome the incoming 9th grade students who complement our returning IPREP veterans. We strive to steadily increase our academic rigor and support our students as they reach their maximum potential. We continue to raise the standard both academically and socially. We offer a variety of exciting dual enrollment and advanced placement courses. The Advanced Placement Academy provides a comprehensive education for our students that will help prepare them for their education beyond high school. Extra-curricular activities are an important component to a well-rounded education, and here, at HML, we have award-winning extra-curricular activities and athletic programs. We have a National Champion and superior-rated music program that is second to none. Our chorus and marching band are continuously asked to perform throughout the county. Our National DECA Chapter of Hialeah Miami Lakes took a record 17 students to the Florida DECA State Conference in Orlando. We also had six of our FBLA students take first place in State competition and move on to compete in the National FBLA Competition in Anaheim, California. Our Model United Nations Club is ranked in the top 50 in the country for the third consecutive year. At HML, we strongly encourage our students to challenge themselves to be the best. Excellence is expected. Our graduating seniors are attending some of the most prestigious colleges and universities in the nation. While we are proud of our accomplishments, we are not resting on our laurels. We continue to work to provide the best educational opportunities for all our students. I am confident that this year will be another banner year for our school. We are enthusiastic about the abundant opportunities our students will have this year, and I look forward to working with everyone and celebrating every step we make toward even greater success.